CRG and Felice Tiene decided to end their collaboration that started back in 2006 and continued until the end of 2016, season in which the Italian driver came third at the OK World Championship in Bahrain. CRG and its driver Felice Tiene ended their working relationship after a 10yrs long collaboration. The 25yrs old driver from San Giuseppe Vesuviano (Napoli, Italy) Felice Tiene has been part of CRG’s team since 2006 – with the only break of season 2009, and obtained several victories with the Italian outfit, including his most prestigious win: the KF2 World Cup in CRG’s triumphal run in Zuera back in 2012, when the Italian driver led Max Verstappen, Jordon Lennox-Lamb and Tom Joyner. Felice Tiene claimed his most recent important result with CRG. 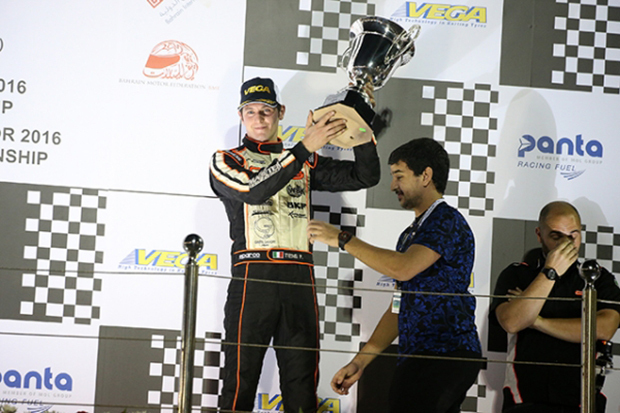 He ended in fact the OK World Championship in Bahrain with the third place of the podium. CRG thanks Felice Tiene for his precious collaboration during these years and for contributing with his sporting results to the promotion of the image of the Italian outfit.